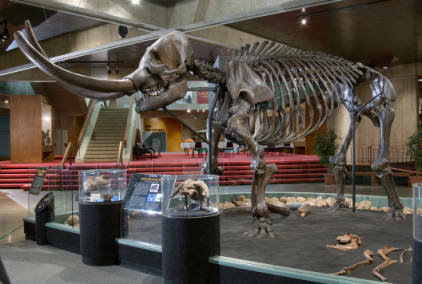 View of a mastodon skeleton known as the Conway Mastodon that is on display at the Ohio History Center in Columbus, Ohio. During the Ice Age, mastodons roamed the North American continent. This skeleton was found in 1887 in a swamp located between Champaign and Clark counties in Ohio. It is known as the Conway Mastodon because it was presented to The Ohio State University by Newton S. Conway in 1894. The skeleton came to the Ohio History Connection, on loan from The Ohio State University, in 1970. It is estimated that this mastodon was 20 to 30 years old when it died. It stands 10 feet high at the shoulder and each of its ivory tusks weighs more than 100 pounds. About 1.8 million years ago the warm climate of the Cenozoic Era cooled sufficiently for large continental glaciers to begin to accumulate in far northern latitudes. As the ice built to a great thickness it began to slowly flow outward and into the northern United States, including about two-thirds of Ohio. Thus began the Pleistocene Ice Age, which profoundly changed Ohio's landscape to the benefit of our society and left the first record of geologic events in Ohio since more than 290 million years ago. Ice ages are complex events that are poorly understood and may be initiated by variations in the output of the sun, perturbations in the earth's orbit and revolution, continental configurations, and ocean circulation. A long ice age has many intervals of glacial advance and retreat with warmer interglaciations between the glacial advances. The classic interpretation of these advances and retreats in the Midwest is four major glacial advances named after states in which their deposits are prominent. They are, from oldest to youngest: Nebraskan, Kansan, Illinoian, and Wisconsinan. Geologists now recognize that the Pleistocene was more complex than implied by this four-fold division. In Ohio, the earlier glaciations, before the Illinoian, are lumped as "pre-Illinoian." These deposits are known in Ohio from deeply weathered sediments exposed in a small area in Hamilton County, near Cincinnati. Before the Pleistocene glaciation, Ohio was much different than today. Lake Erie did not exist and a major river, the Erigans River, flowed in a wide valley where the lake is today. Much of Ohio was drained by an ancient river, known as the Teays, that had headwaters in North Carolina and flowed northward across Virginia and West Virgina, entering Ohio near Portsmouth. The Teays River then flowed northward to Chillicothe then westward across western Ohio, Indiana, Illinois, and into the ancestral Mississippi River. The Ohio River did not exist at this time. Some geologists speculate that the Teays flowed northward from Chillicothe and joined the Erigans River. When the earliest ice sheets penetrated Ohio they dramatically changed drainage patterns in the state. The Erigans River was destroyed and the Teays River was dammed in southern Ohio. A large, ice-dammed lake, Lake Tight, formed in the valleys of southern Ohio, and adjacent Kentucky and West Virginia. Eventually, the lake spilled over low divides and cut new channels. This was the beginning of the creation of the Ohio River. The deep valleys of the Teays River and its tributaries were filled with sediment as they were overridden by the glacier. In some places in western Ohio the buried valley of the Teays River is more than 400 feet deep but no hint of it is visible on the flat surface of the landscape. The advance of the Illinoian glacier 300,000 years ago continued the modification of the Ohio landscape, eroding bedrock and older sediments and depositing sediment as it melted. This glacier advanced the farthest south of any of the glaciations in Ohio. Deeply weathered Illinoian deposits are present in southwestern Ohio and in a narrow band through east-central Ohio. The most recent and best preserved glacial deposits are from the Wisconsinan glaciation. This glacier entered Ohio about 24,000 years ago and was gone from the state by 14,000 years ago. These lobate deposits blanket western, central and northern Ohio and form most of the dominant features of the landscape. Most of this area is covered with a heterogeneous mixture of clay, silt, and rocks, known as till. Most of this was deposited beneath the ice as it slid along or was left as the ice melted and is known as ground moraine. As the Wisconsinan glacier started its final northward retreat about 18,000 years ago, it paused occasionally as advance and retreat were in equilibrium and formed a low ridge of till at its snout as the ice disgorged the sediment it had scraped up in its long journey from northern Canada. These arcuate ridges and hills are end moraines End moraines preserved as the glacier retreated are recessional moraines. As the ice melted, huge volumes of water were discharged, forming river valleys that were filled with sediment from the melting ice. These outwash deposits filled valleys with sediment that is today mined for sand and gravel and is an important aquifer for ground water. Other sand and gravel deposits formed in tunnels beneath the ice (eskers) or against the ice front as meltwater poured over the edge of the ice (kames). Many glacial deposits contain large boulders (glacial erratics) of igneous and metamorphic rocks not native to Ohio. Some are several feet in diameter and bear witness to the erosive and transporting power of glaciers. The exposed surface of beds of Paleozoic limestone have a planed surface with deep scratches formed when ice slid across them and pebbles frozen in the ice formed the scratches. The Glacial Grooves on Kellys Island in Lake Erie are among the largest and most famous of these glacially eroded features. As the Wisconsinan glacier retreated north of the Erie basin about 14,000 years ago, a large meltwater lake formed in the valley of the pre-glacial Erigans River. The valley had been deepened by the gouging of several glaciations. A complex series of lake stages formed as the ice retreated northward. Initially, the lake ( Lake Maumee stage) drained westward into the Wabash River and northwestern Ohio accumulated lake sediments. Sandy beach ridges formed along the shoreline at each of these stages, thus marking the former extent of each lake state. Eventually the ice had retreated far enough northward so that the lake could drain eastward through the Niagara River into Lake Ontario and then into the St. Lawrence River. Lake Erie is one of Ohio's greatest resources and owes its origin entirely to Pleistocene glaciers. Many plants and animals that lived in Ohio during the Pleistocene were identical or similar to those that live here today or were living here at the time of European settlement. However, there were many creatures, especially larger animals (megafauna) that became extinct at the end of the Pleistocene about 10,000 years ago. These include the elephant-like mastodon and mammoth, stag-moose, giant ground sloth, peccary, tapir, short-faced bear, giant beaver, long-horned bison, and others. Although remains of saber-toothed cat or dire wolf have not yet been found in the state, they have been found in adjacent states and undoubtedly lived in Ohio. These animals lived in open-spruce forests dotted with small glacial lakes (kettles). Many skeletal remains are discovered when these now filled-in kettle lakes are excavated. The climate warmed abruptly about 10,000 years ago and the vegetation changed quickly from spruce to more familiar deciduous vegetation. It is thought that the change in vegetation was responsible for the extinction of the megafauna. Some researchers have speculated that Paleoindian hunters contributed to this extinction event. Ohio owes much of its prosperity to the glaciers of the Pleistocene Ice Age. Our rich agricultural soils are glacial deposits scraped up as the glaciers moved south. One only has to compare agriculture in western, central, and northern Ohio with that of unglaciated southeastern Ohio, where the soils are thin and unproductive. Lake Erie and the Ohio River, major sources for water, transportation, and recreation were created by the glaciers. The abundant sand and gravel deposits of the state furnish a vital building material that is used in the production of roadbeds, concrete, and many other uses. These deposits are important aquifers for abundant supplies of ground water. Glacial clays have been used extensively to make bricks and other ceramic products. Finally, the glaciers did the final sculpting of the landscape, providing building sites and scenic vistas. During the Holocene Epoch, the last 10,000 years, modern streams have deepened their valleys and humans have modified the landscape in many areas, but basically we look at the land on a daily basis much as it was left by the glaciers.